The recent exhibition at the Design Museum, ‘California: Designing Freedom’, looked at Californian designed objects that embody personal freedom, from the surf board to the iPhone. The exhibits included a full-size geodesic dome that visitors can enter; it reminds one of the remnants of dome structures that you can still see travelling along Route 66 in California. 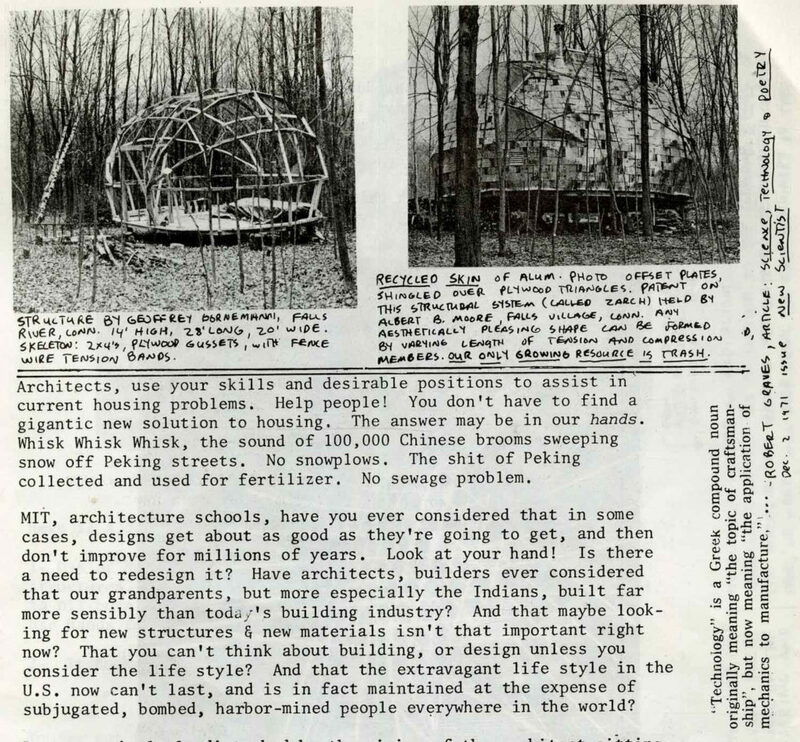 The AA Library holds several publications about making your own dome structure, which came out of the movement for self-built homes in the 1960s and the interest in new technologies and new materials to solve the housing crisis on an overpopulated earth. 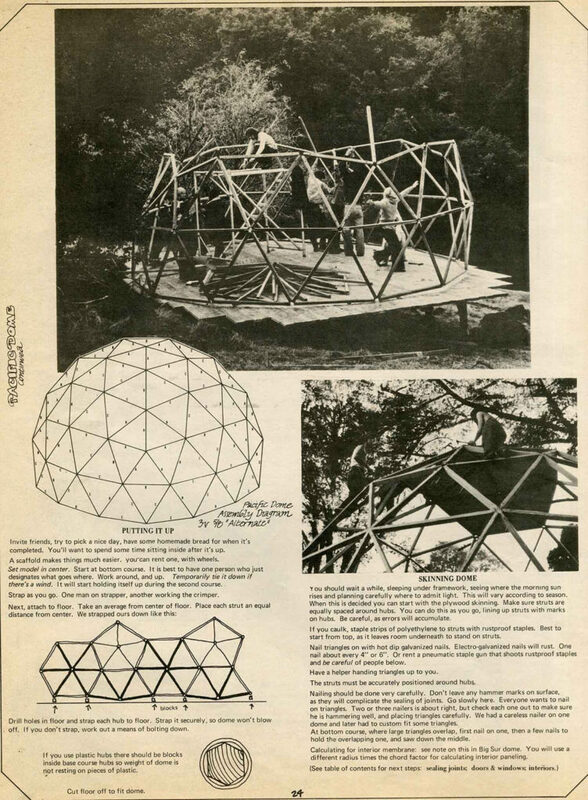 One of these, Domebook 2, written by Lloyd Kahn and published in 1971, shows how to construct different kinds of dome structures, from cardboard geodesic play-domes to domes made of ferro-concrete. 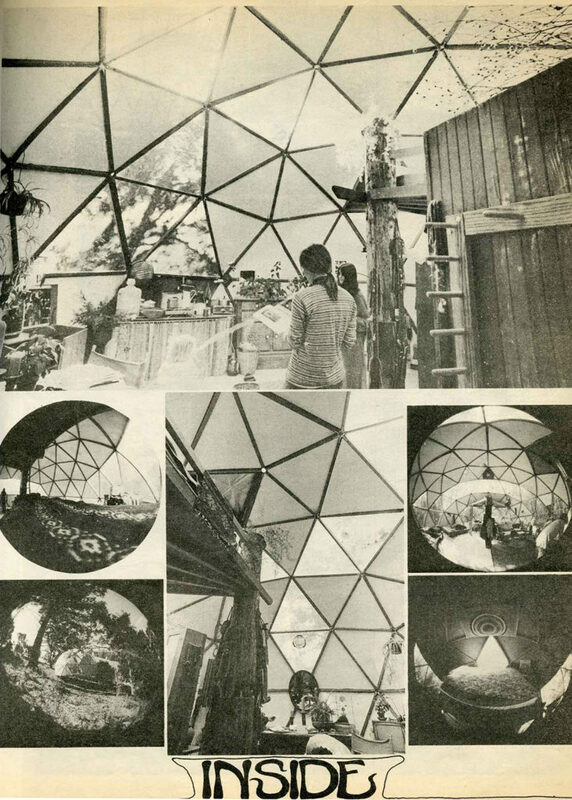 Based on the experience of building 17 domes at an experimental high school, Pacific High School, the Domebook 2 describes itself as ‘an instruction manual for builders and a story book of some new communities in America’. It contains over 100 pages with brief and clear instructions and conversations about inspirations for building shelter out of domes. 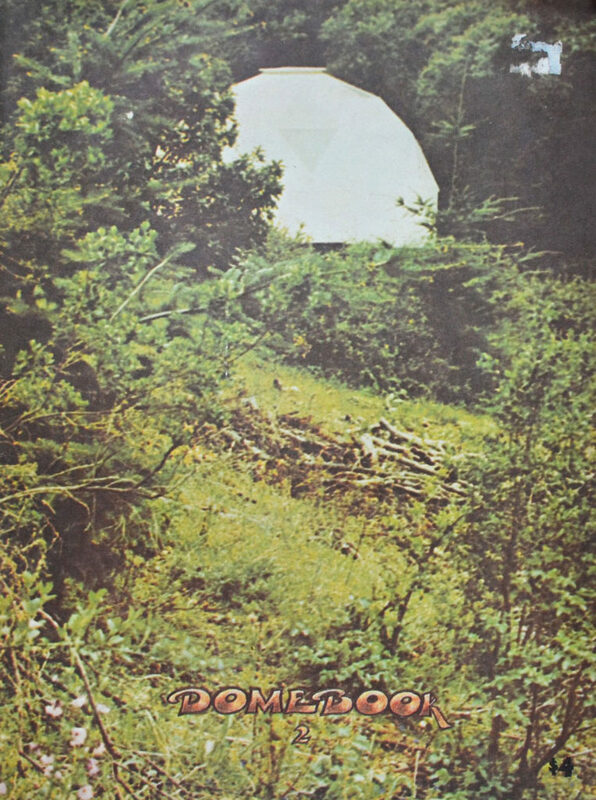 The book also includes an interview with R. Buckminster Fuller, the driving force behind the dome movement. 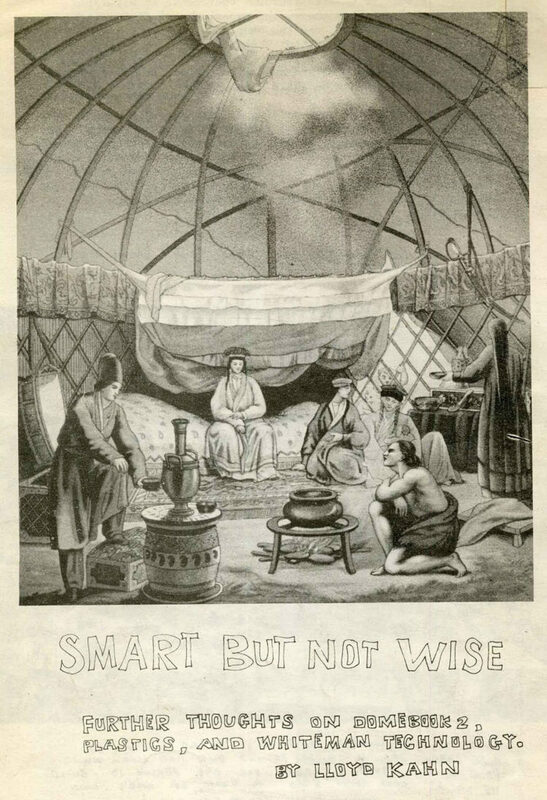 The Library copy of Smart but not wise was presented by Tony Gwilliam in 1972. He taught at the AA from c1971-75, and later worked on hoop-shaped apartments and suspension-based structures. 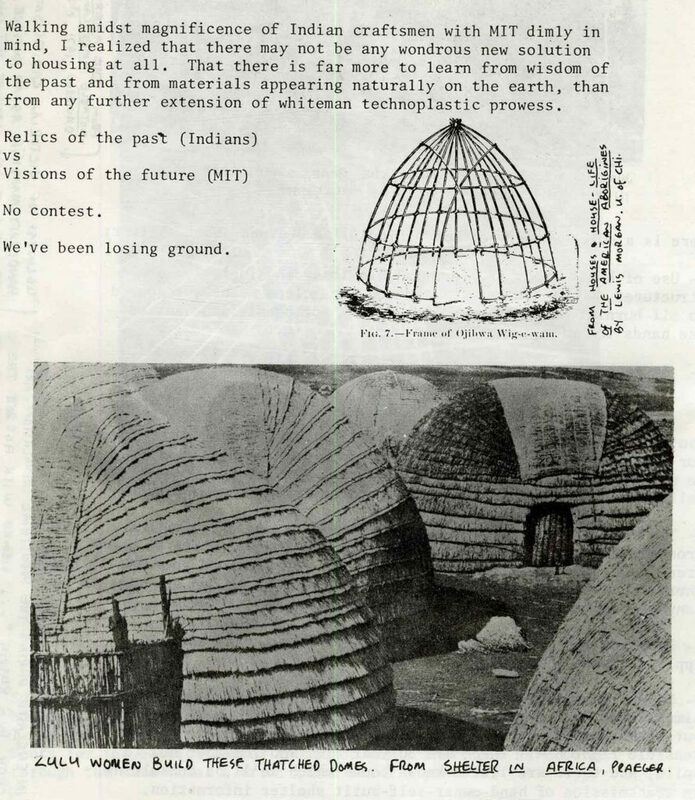 At the AA Gwilliam and his unit (Intermediate Unit 6) created a series of remarkable Mantainer units, including a giant portable inflatable dome which he dubbed a ‘suitcase for living’ in 1974-75 (see images in the Photo Library).